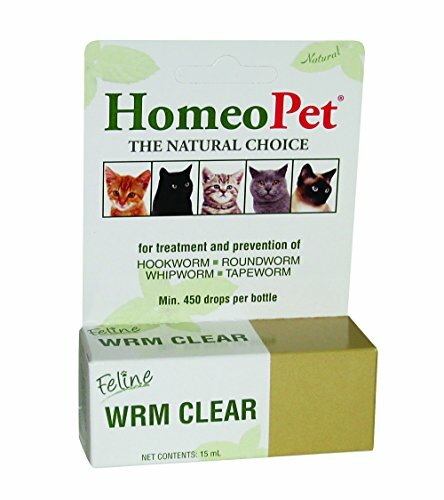 HomeoPet WRM Clear does not kill the worms; it gently creates and environment in the body that the worms can no longer live in, thereby flushing them harmlessly from the body.It takes 2 weeks for the product to reach its maximum potential in the body. During this time you may see live worms in the stool. Seeing live worms is a good indication that the product is working. You may continue to see worms coming out for up to 4 weeks after the last dose, and this is because it takes that long for worm eggs to hatch. The effect of the product remains active in the body for up to 2 months after the last dose, thus inhibiting re-infestation within that time period in spite of contact with worms. 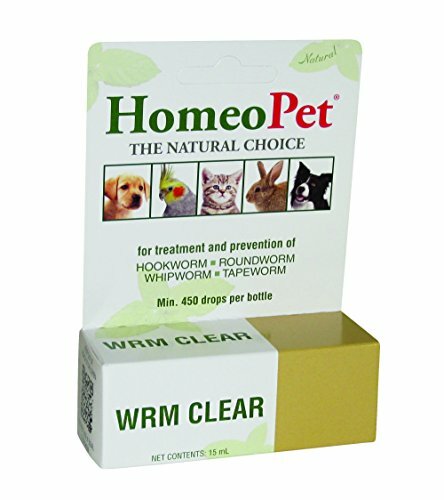 A natural remedy for prevention and removal of hookworms, roundworms and tapeworms. Ingredients: granatum, kamala, chenopodium anthelminticum, filixmas, cucurbita pepo, thymol, teucrium marum, cina, spigella anthelmintica, naphtaline, nux vomica, arsenicum album. Administer 3 times a day orally or use with food or water. Dosage: under 20 Lbs, 5 drops; 20-100 Lbs, 10 drops; over 100 Lbs, 15 drops. As a preventative, use for 7 days and as a treatment, use for 14 days. 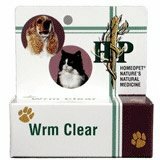 Safe for kittens, puppies, pregnant and nursing animals.